digiPlaySpace is family-friendly interactive exhibition which encourages children to engage with the latest media technologies to share and promote new artistic experiences and was launched at TIFF in 2012. The original 13-day exhibition proved so popular with audiences that it became a yearly exhibition and now runs for nine weeks from mid-February to mid-April, culminating with the TIFF Kids International Film Festival. 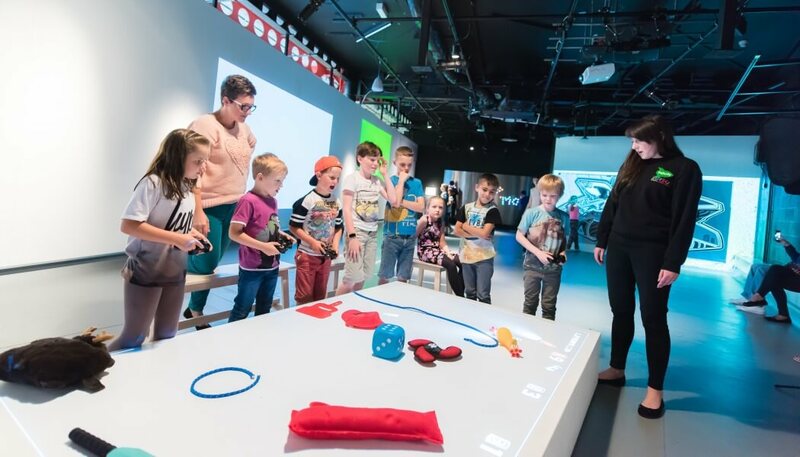 digiPlaySpace allows kids to touch, control and play all exhibits and combines fun and learning with robots, electronics, stop-motion animation, music and gaming. The digiPlaySpace exhibition has been made possible through a £60,000 grant from the Arts Council England; £5,000 from the Holbeck Charitable Trust and museum funds. Journey through an immersive 3D environment of thousands of moving particles in this single-player video game. Connect anything conductive to this powerful little circuit board and create your own unique musical instrument. Jump, dance and play to create colourful animations as your movements are transformed into larger-than-life characters right in front of you. Interact with colourful ‘cloud-hoppers’ and hop from cloud to cloud in this playful digital experience. digiPlaySpace’s arrival at Eureka! marked the museum’s 25th anniversary year. It has led to the museum’s busiest summer ever with nearly 60,000 visitors, which means it is set to pass 300,000 visitors in 2017 last surpassed in 1998. Eureka!’s existing Halifax site will be extended into the adjacent 3600sqm (38,750 sq ft) Great Northern Shed heritage building within the next six years; extending the age range it can appeal to while welcoming an additional 150k to 200k visitors per year. Eureka! is also working with the Liverpool City Region on the £11m Wirral project to be located on the site adjacent to Seacombe Ferry Terminal. It is backed by Merseytravel (who run the site) and Wirral Council alongside strategic support from the Liverpool City Region Local Economic Partnership and the Metro Mayor Steve Rotheram. The building will focus on 7-14s to develop the technical and digital skills of children and teenagers to meet the demands of a changing workforce in the 21st century. It could open as early as 2021, if fundraising is successful. Admission to digiPlaySpace is included in the price of admission to Eureka! or free to the museum’s Annual Pass holders and will now run until 15 April 2018.